Bankruptcy Information | Should I fight my Florida foreclosure? Yes! Should I fight my Florida foreclosure? Yes! Home > Foreclosure Defense > Should I fight my Florida foreclosure? Yes! 25 Mar Should I fight my Florida foreclosure? Yes! 1) Your mortgage servicer’s loss mitigation department may provide you with a “reinstatement figure.” If you pay it, the servicer will reinstate the mortgage and dismiss the foreclosure. This option typically has a couple of problems associated with it. First of all, the servicer will not be very cooperative, even if it promises you that the reinstatement figure is on the way. Even if you successfully obtain a reinstatement figure, you still must come up with the cash to pay the amount due to stop the foreclosure. 2) You can seek a complete refinance of the existing mortgage in foreclosure. This option is limited to a very small group of people. There must be sufficient equity to entice another lender to pay off the defaulted mortgage. This becomes even more difficult if there is a second mortgage because that must also be paid off. Given the much publicized “credit crunch” on Wall Street, only those borrowers with substantial and verifiable income will most likely qualify. 3) You can place your home on the market and attempt to sell it. This may not be a realistic option because home values are still dropping each day, and you may now have no equity or negative equity. I have previously discussed the possibility of a short sale, but if you are in a foreclosure, you are under the additional pressure of time. There is only a small window of opportunity until closing on the sale of your home will become impossible before a foreclosure sale date, and your mortgage servicer will be in no hurry to cooperate. See option #1 above. 4) You can file a Chapter 13 reorganization bankruptcy. There are a bunch of excellent blogs on the subject of filing a Chapter 13 on Bankruptcy Law Network, but you can only save your home in a Chapter 13 bankruptcy if you can make the monthly Chapter 13 Plan payment. Chapter 13 can buy you time, but if your case is dismissed for nonpayment, the mortgage servicing company will resume the foreclosure. If you have regular income, this is the way to go. 5) You can give up and move out. This is an option that many people are choosing in this current economic climate. Maybe the reason you fell behind in your mortgage is a long term loss of income. You cannot meet the requirements of one of the four previous options, and you are ready to move on. There are two major problems with this option. The first problem is that you will definitely have a foreclosure on your credit report. 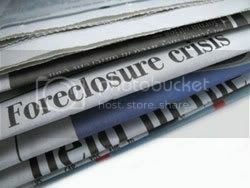 Secondly, there is a possibility that the mortgage company will still be owed a balance after the foreclosure sale. This leads to a deficiency balance owed by you to the mortgage company. 6) You can fight against your foreclosure. It is not a given that your mortgage servicer will succeed easily in a foreclosure . . . unless you do nothing. This may sound too good to be true, but your mortgage company may have filed an improper foreclosure lawsuit. Across the country, judges are punishing mortgage companies for incomplete record keeping and for violations of law. You may have valuable defenses and counterclaims against your mortgage company that could actually prevent foreclosure and even require your mortgage servicing company to pay you damages. You may even be able to force your lender to completely rewrite the terms of your note and mortgage, enabling you to keep your home. Here’s how you can fight your foreclosure!